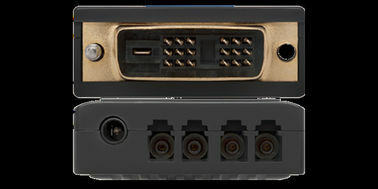 DVI Fiber Optical Transceiver consists of transmitter module and receiver module, each of which has 2XLC connectors and a 20-pins DVI–D plug. Users could decide extension length at their discretion by choosing the length of fiber-optic cables with LC ferrules at the ends. It offers graphic TMDS signals to be extensible up to the limits of modal bandwidth of selected multi-mode glass fibers, or single mode fiber. A transmitter has 4 Laser inside and a receiver has 4 Pin-PDs inside. and each transmitter or Receiver also has a WDM filter inside, which combine the 1310nm laser and 1550nm laser into one fiber. 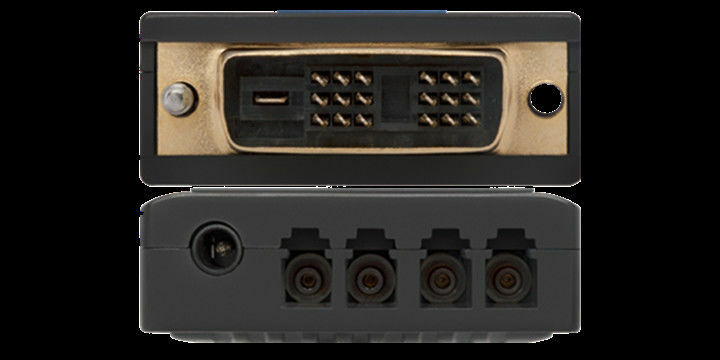 it has a capability to transmit UXGA (1600X1200) graphic signals with 60Hz refresh rate. At such data bandwidth, this module can extend up to 1,640 feet (500 meters) much over the limits of copper wire extension, without any distribution amplifier or repeater. Up to 500m with 4 core LC fibers.